Despite false information online, Lyme disease is quite geographically restricted. The CDC reports “in 2015, 95% of confirmed Lyme disease cases were reported from 14 states.” This creates a natural experiment where it’s possible to see if Lyme incidence in areas of high Lyme disease incidence correlates to any other diseases. 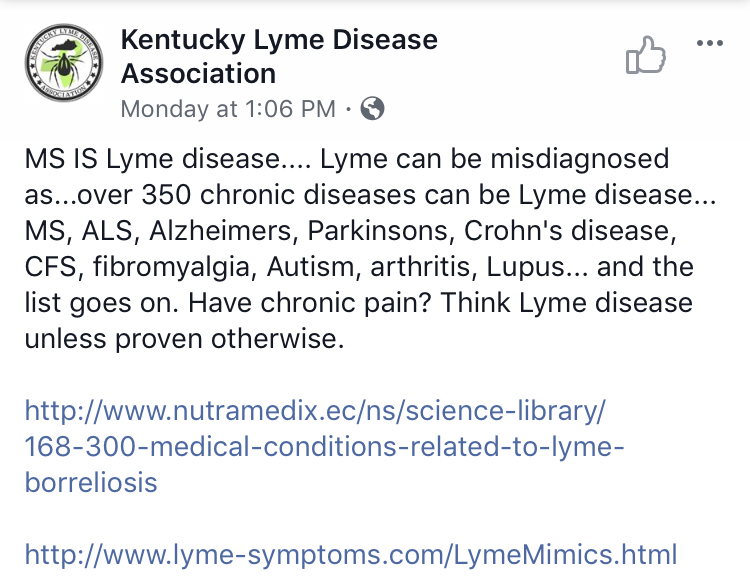 Lyme disease has been blamed—with no compelling evidence—for autism, Alzheimer’s disease, Amyotrophic Lateral Sclerosis (ALS aka Motor Neuron Disease, MND, or Lou Gehrig’s Disease), Multiple Sclerosis (MS), Parkinson’s Disease, cancers, and suicides. Chronic Lyme activists falsely state that Lyme disease either causes or commonly “mimics” just about everything. But is any of this true? These are testable hypotheses. CDC scientists compared Lyme disease prevalence to death rates for ALS, MS, Parkinson’s disease, and Alzheimer’s disease, as illustrated in the figure below. They found no link between Lyme disease and any of ALS, MS, or Parkinson’s. Although associations between Lyme disease and Alzheimer disease, ALS, MS, and Parkinson disease have been proposed by writers of speculative websites and articles, supportive evidence for such an association is lacking. 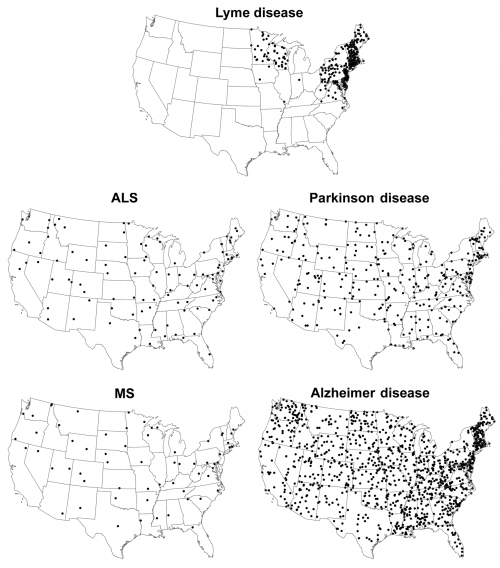 The absence of a positive correlation in the geographic distributions of these conditions provides further evidence against an association between Lyme disease and deaths from these 4 neurodegenerative conditions. In 2000, NIH researchers looked at brain samples from 15 Alzheimer’s patients and found no evidence of DNA from Lyme bacteria (borrelia) in any of them. A 2014 study in the Journal of Alzheimer’s also found no positive correlation between Lyme disease and Alzheimer’s disease. The MS Society discussed two uncited studies of antibodies in blood that did not indicate that Lyme disease is related to MS.
After the initial diagnosis, the man left the office, unable to cope with the fact that he had an incurable degenerative disease, likely to kill him within five years. He chose to visit a naturopath instead, who had redemptive news: conventional, narrow-minded medicine had misdiagnosed him. It wasn’t ALS, the naturopath said, but rather chronic Lyme disease, which could be treated with holistic, all-natural supplements. Nearly a year later, badly degenerated, the man was back in Novella’s office. He’d wasted countless hours and thousands of dollars on false hope. Now, he was willing to listen, but with far less time to prepare for the reality of what lay ahead, and a spirit broken by disappointment. In 2013, scientists analyzed serum samples of 120 children, including 70 with autism and 50 without autism. None of the 120 children tested positive for anti-bodies to Lyme using well established two-tier testing. The study’s sample size is large enough to effectively rule out the suggested high rates of Lyme disease or associated seroprevalence among affected children. NIH scientists performed a similar study by looking at 183 children: 104 with autism, 24 with developmental delays, and 55 neurotypical controls. All 183 children tested negative for Lyme antibodies and had no history of Lyme disease. There was no evidence of an association between Lyme disease and autism. Thankfully, the “Lyme-Induced Autism Foundation” is now defunct. Sadly, many of the doctors who spoke at “Lyme-Induced Autism” conferences are still practicing. 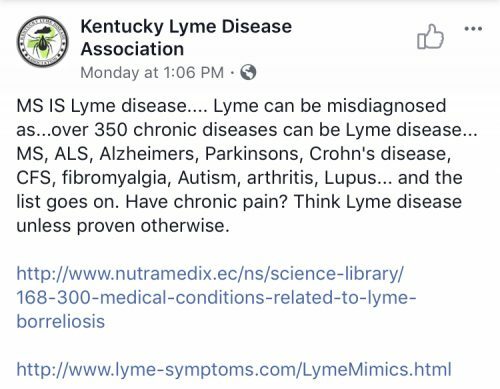 Why is there a Kentucky Lyme Disease Association when each year from 2006-2016 averaged about 8 confirmed Lyme cases? Because chronic Lyme is spread by word of mouth and the internet, not ticks. Qureshi M, et al. Lyme disease serology in amyotrophic lateral sclerosis. Muscle Nerve. 2009;40(4):626-8. NIH Researchers: Lack of evidence of Borrelia involvement in Alzheimer’s disease. Willis MS, Bai Y. Confounding issues in the diagnosis of multiple sclerosis: lyme disease testing. Lab Med. Figure from CDC: Geographic distribution of Lyme disease compared with that for deaths due to amyotrophic lateral sclerosis (ALS), Parkinson disease, multiple sclerosis (MS), and Alzheimer disease. One dot represents 1 case (Lyme disease) or 1 death (ALS, Parkinson disease, MS, and Alzheimer disease) per 100,000 person-years; dots are placed randomly within the respective states.